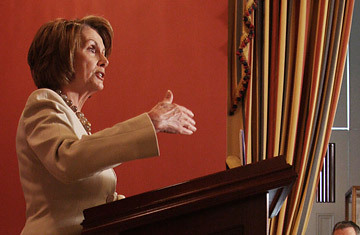 House Speaker Nancy Pelosi of California speaks at her weekly news conference on Capitol Hill in Washington. A compromise deal to extend the federal government's domestic spying powers, passed by the House on Friday and expected to sail through the Senate next week, has drawn attacks from both sides of the political spectrum. The right is unhappy at concessions made to protect civil liberties; the left is furious that the Democrats allowed the domestic spying powers to be extended in any form. Much of the latter's rage has been directed against Nancy Pelosi, the liberal House Speaker who was instrumental in negotiating the deal  attacking her on the Internet and virtually shutting down her switchboard with complaints. One blogger called Pelosi "disturbingly disoriented" and said the deal she and her allies have cut will "eviscerate the Fourth Amendment, exempt their largest corporate contributors from the rule of law, and endorse the most radical aspects of the Bush lawbreaking regime." What motivated Pelosi and the Democrats to incur the wrath of their liberal base and allow one of the Administration's most controversial anti-terror policies to be extended? A mix of politics, pragmatism and some significant concessions. First of all, Pelosi wanted the issue off the table for the political campaign this fall. Despite anti-G.O.P. sentiment in the country and record low popularity for President George W. Bush, Democrats still trail on national security, and that could hurt them in Congress. Stonewalling the Administration and letting the surveillance powers expire could have cost the Democrats swing seats they won in 2006 as well as new ones they have a chance to steal from Republicans this November. "For any Republican-leaning district this would have been a huge issue," says a top Pelosi aide, who estimates that as many as 10 competitive races could have been affected by it. Pelosi realized that conservative freshman Democrats like Nancy Boyda of Kansas and centrist Southern representatives were willing to squeeze the Administration for a compromise as long as she got one in the end. That made it possible for her to let the Protect America Act  which passed last August and granted full approval to the Adminstration's expansive surveillance powers  expire in February, and set up her negotiating position through the spring. Letting the PAA expire was a risk  the Administration pilloried Democrats for being soft on terrorism. But Pelosi successfully parlayed it into specific improvements. For example, under Administration proposals, the telecoms would have received full retroactive immunity from lawsuits brought by civil libertarians alleging they violated the Fourth Amendment by complying with Administration requests to conduct wiretaps following 9/11. In negotiations with Pelosi's office, the telecoms offered a compromise: Let a judge decide if the letters they received from the Administration asking for their help show that the government was really after terrorist suspects and not innocent Americans. Pelosi also got other improvements, including a review of and report on Bush's domestic surveillance program by the Justice Department inspector general and a provision making clear that Congress does not give the President a free pass on complying with domestic surveillance laws during wartime. "This bill strengthens congressional oversight," Pelosi argues. Pelosi had another reason for backing the compromise: unlike some on the left, she actually believes domestic surveillance laws needs updating in light of the new terror threats. "We can't go without a bill," she said on the House floor Friday, "That's simply just not an option." Existing U.S. surveillance law, passed in 1978, needs to be improved, she believes, not just to protect Americans at home but to protect U.S. troops in the field. "Our troops in the field depend on timely and reliable intelligence," she said.